AUD 5,339 Excl. Duties / Taxes. This Heart diamond is 0.9 carat in weight, and comes with Very Good polish and Very Good symmetry, as verified from an independent gemological laboratory. The diamond is graded G in colour, and has a clarity grade of IF. The diamond's IGI grading report number is S2H92564, which will detail further its specifications and measurements, and will also come with the purchase of the stone. AUD 27,303 Excl. Duties / Taxes. 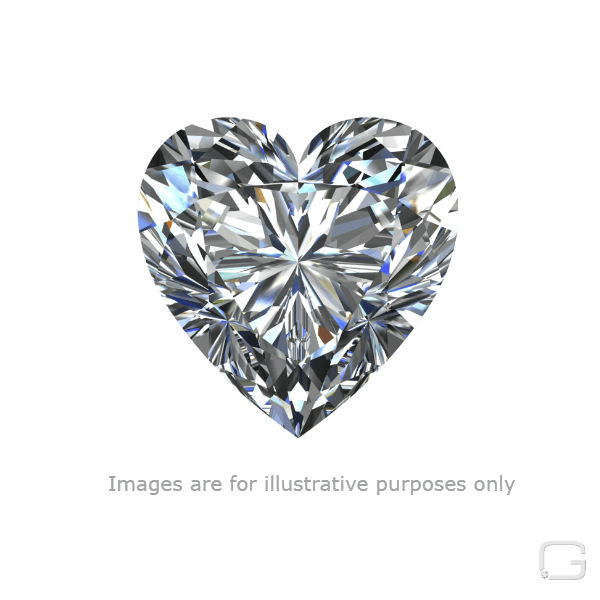 This Heart diamond is 2.01 carat in weight, and comes with Excellent polish and Excellent symmetry, as verified from an independent gemological laboratory. The diamond is graded G in colour, and has a clarity grade of IF. The diamond's HRD grading report number is 190000038105, which will detail further its specifications and measurements, and will also come with the purchase of the stone. AUD 8,587 Excl. Duties / Taxes. This Heart diamond is 1.03 carat in weight, and comes with Excellent polish and Very Good symmetry, as verified from an independent gemological laboratory. The diamond is graded G in colour, and has a clarity grade of IF. The diamond's GIA grading report number is 6312878579, which will detail further its specifications and measurements, and will also come with the purchase of the stone. AUD 2,549 Excl. Duties / Taxes. This Heart diamond is 0.51 carat in weight, and comes with Excellent polish and Very Good symmetry, as verified from an independent gemological laboratory. The diamond is graded D in colour, and has a clarity grade of IF. The diamond's GIA grading report number is 7213708274, which will detail further its specifications and measurements, and will also come with the purchase of the stone. AUD 3,687 Excl. Duties / Taxes. This Heart diamond is 0.7 carat in weight, and comes with Excellent polish and Good symmetry, as verified from an independent gemological laboratory. The diamond is graded E in colour, and has a clarity grade of IF. The diamond's GIA grading report number is 6325414759, which will detail further its specifications and measurements, and will also come with the purchase of the stone. AUD 3,405 Excl. Duties / Taxes. This Heart diamond is 0.61 carat in weight, and comes with Excellent polish and Very Good symmetry, as verified from an independent gemological laboratory. The diamond is graded E in colour, and has a clarity grade of IF. The diamond's GIA grading report number is 1206122223, which will detail further its specifications and measurements, and will also come with the purchase of the stone. AUD 2,425 Excl. Duties / Taxes. This Heart diamond is 0.61 carat in weight, and comes with Excellent polish and Excellent symmetry, as verified from an independent gemological laboratory. The diamond is graded G in colour, and has a clarity grade of IF. The diamond's GIA grading report number is 1192622787, which will detail further its specifications and measurements, and will also come with the purchase of the stone. AUD 2,751 Excl. Duties / Taxes. This Heart diamond is 0.64 carat in weight, and comes with Excellent polish and Excellent symmetry, as verified from an independent gemological laboratory. The diamond is graded I in colour, and has a clarity grade of IF. The diamond's GIA grading report number is 2201074773, which will detail further its specifications and measurements, and will also come with the purchase of the stone. AUD 2,897 Excl. Duties / Taxes. This Heart diamond is 0.7 carat in weight, and comes with Excellent polish and Very Good symmetry, as verified from an independent gemological laboratory. The diamond is graded G in colour, and has a clarity grade of IF. The diamond's GIA grading report number is 1192644441, which will detail further its specifications and measurements, and will also come with the purchase of the stone. AUD 13,887 Excl. Duties / Taxes. This Heart diamond is 1.01 carat in weight, and comes with Excellent polish and Very Good symmetry, as verified from an independent gemological laboratory. The diamond is graded D in colour, and has a clarity grade of IF. The diamond's GIA grading report number is 7202435645, which will detail further its specifications and measurements, and will also come with the purchase of the stone. AUD 3,953 Excl. Duties / Taxes. This Heart diamond is 0.81 carat in weight, and comes with Excellent polish and Very Good symmetry, as verified from an independent gemological laboratory. The diamond is graded F in colour, and has a clarity grade of IF. The diamond's GIA grading report number is 5316791487, which will detail further its specifications and measurements, and will also come with the purchase of the stone. AUD 6,911 Excl. Duties / Taxes. This Heart diamond is 1.01 carat in weight, and comes with Excellent polish and Very Good symmetry, as verified from an independent gemological laboratory. The diamond is graded F in colour, and has a clarity grade of IF. The diamond's GIA grading report number is 2205182170, which will detail further its specifications and measurements, and will also come with the purchase of the stone. AUD 7,710 Excl. Duties / Taxes. This Heart diamond is 0.73 carat in weight, and comes with Excellent polish and Very Good symmetry, as verified from an independent gemological laboratory. The diamond is graded D in colour, and has a clarity grade of IF. The diamond's GIA grading report number is 6311157067, which will detail further its specifications and measurements, and will also come with the purchase of the stone. AUD 4,271 Excl. Duties / Taxes. This Heart diamond is 0.9 carat in weight, and comes with Excellent polish and Very Good symmetry, as verified from an independent gemological laboratory. The diamond is graded I in colour, and has a clarity grade of IF. The diamond's GIA grading report number is 5191422979, which will detail further its specifications and measurements, and will also come with the purchase of the stone. This Heart diamond is 0.72 carat in weight, and comes with Excellent polish and Very Good symmetry, as verified from an independent gemological laboratory. The diamond is graded G in colour, and has a clarity grade of IF. The diamond's GIA grading report number is 2195655727, which will detail further its specifications and measurements, and will also come with the purchase of the stone. AUD 3,717 Excl. Duties / Taxes. This Heart diamond is 0.74 carat in weight, and comes with Excellent polish and Excellent symmetry, as verified from an independent gemological laboratory. The diamond is graded G in colour, and has a clarity grade of IF. The diamond's GIA grading report number is 2191793297, which will detail further its specifications and measurements, and will also come with the purchase of the stone. AUD 9,297 Excl. Duties / Taxes. This Heart diamond is 1.5 carat in weight, and comes with Excellent polish and Very Good symmetry, as verified from an independent gemological laboratory. The diamond is graded L in colour, and has a clarity grade of IF. The diamond's GIA grading report number is 2195507801, which will detail further its specifications and measurements, and will also come with the purchase of the stone. AUD 8,007 Excl. Duties / Taxes. This Heart diamond is 0.76 carat in weight, and comes with Excellent polish and Very Good symmetry, as verified from an independent gemological laboratory. The diamond is graded D in colour, and has a clarity grade of IF. The diamond's GIA grading report number is 3305855465, which will detail further its specifications and measurements, and will also come with the purchase of the stone. AUD 8,694 Excl. Duties / Taxes. This Heart diamond is 1.01 carat in weight, and comes with Excellent polish and Excellent symmetry, as verified from an independent gemological laboratory. The diamond is graded F in colour, and has a clarity grade of IF. The diamond's GIA grading report number is 6321228750, which will detail further its specifications and measurements, and will also come with the purchase of the stone. AUD 12,691 Excl. Duties / Taxes. This Heart diamond is 1.02 carat in weight, and comes with Very Good polish and Good symmetry, as verified from an independent gemological laboratory. The diamond is graded D in colour, and has a clarity grade of IF. The diamond's GIA grading report number is 12151956, which will detail further its specifications and measurements, and will also come with the purchase of the stone. This Heart diamond is 1.01 carat in weight, and comes with Excellent polish and Very Good symmetry, as verified from an independent gemological laboratory. The diamond is graded F in colour, and has a clarity grade of IF. The diamond's GIA grading report number is 7321228738, which will detail further its specifications and measurements, and will also come with the purchase of the stone. AUD 5,716 Excl. Duties / Taxes. This Heart diamond is 1.02 carat in weight, and comes with Excellent polish and Excellent symmetry, as verified from an independent gemological laboratory. The diamond is graded I in colour, and has a clarity grade of IF. The diamond's GIA grading report number is 1319416732, which will detail further its specifications and measurements, and will also come with the purchase of the stone. AUD 40,568 Excl. Duties / Taxes. This Heart diamond is 2.4 carat in weight, and comes with Excellent polish and Very Good symmetry, as verified from an independent gemological laboratory. The diamond is graded E in colour, and has a clarity grade of IF. The diamond's GIA grading report number is 6193951933, which will detail further its specifications and measurements, and will also come with the purchase of the stone. AUD 6,393 Excl. Duties / Taxes.